Thousands of Google workers staged protests at the company’s campuses over President Donald Trump’s executive order banning travel into the US from seven Muslim-majority countries. The protests come after a weekend of demonstrations around the world, many taking place at airports where travelers were detained as they tried to enter the US. CEOs from a number of leading tech companies, including Google CEO Sundar Pichai, spoke out against the ban while Trump defended his order. More than 100 Google staff were reported to be directly affected by the president’s decision. On Monday, Google employees expressed their solidarity with affected colleagues and their anger at the ban by staging a walk-out which was supported by Indian-born CEO Pichai and Russian-born co-founder Sergey Brin. “There was a threat of nuclear annihilation. And even then the US had the courage to take me and my family in as refugees,” he said. 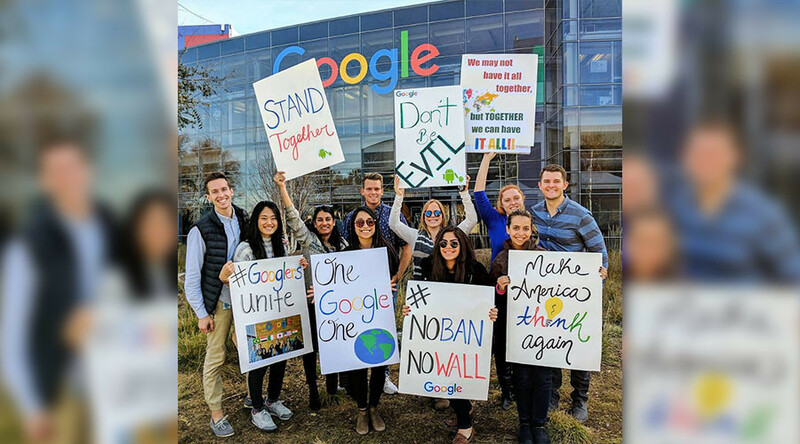 The biggest demonstration took place at the Mountain View, California HQ but sizable walkouts also took place at Google offices in New York, San Francisco and Seattle. The company, which created a $4 million crisis fund in response to Trump’s travel ban, estimated more than 2000 employees took part in the protests.